The world watches as Black and Brown bodies continue to be gunned down by a racialized, hyper-militarized US police force. And we are indignant. 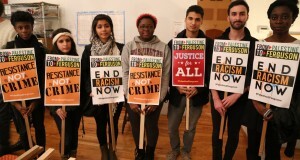 We affirm Palestinian solidarity with Black liberation and support their struggle for the swift and long absent application of justice against police officers who commit heinous, extrajudicial murders of Black people and the systems that create and overpower policing systems. We affirm Palestinian solidarity with the Movement for Black Lives as they protest in the streets against the rising count of marginalized bodies at the hands of police who kill with impunity. We further call for a complete disinvestment in weapons and the business of war and in investment in human rights of Black, Brown, indigenous and Palestinian people anywhere on this planet. We affirm Palestinian solidarity with the families of the victims of racist police violence and with the communities that struggle to rebuild after these murders. As Palestinians continue to live under and resist the Israeli occupation, siege, and racial violence by an army that trains the US police force, border control, and homeland security agencies, we affirm our intersectionality and our common struggle with The Movement for Black Lives. We who believe in Freedom will not rest. Palestinian solidarity with Black liberation.